'Education' as defined by Swami Vivekananda is the manifestation of the perfection that is already in man. 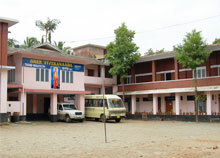 The Sree Vivekanada Teacher Education Centre always looked out for an area where it could contribute to social development in a nurturing and valued manner. Education was identified as this field. Here, with modern educational techniques, to shape and guide young minds. The college is geared specially to provide high quality education adopting the latest techniques and methodology for curriculum transaction and is poised to develop into an institute of higher learning and interdisciplinary research. The institution also aspires to kindle in the students the desire for lifelong learning and for reaching the unreached. The goal behind this establishment is to carve out, good teachers who can be instrumental in nurturing and nursing the future citizens of this country. Situated away from the madding crowd, amidst the green hallowed splendour of Akkikkavu, Sree Vivekananda Teacher Education centre is on the move to fulfil the need of the hour.